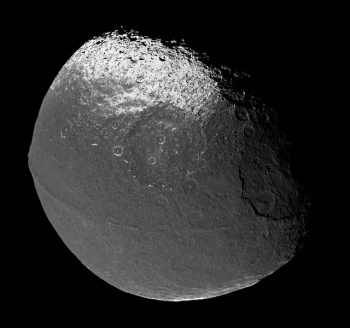 Saturn's third largest moon, Iapetus has an unusual feature that continues to puzzle astronomers: a massive ridge that runs three quarters around the moon's equator. 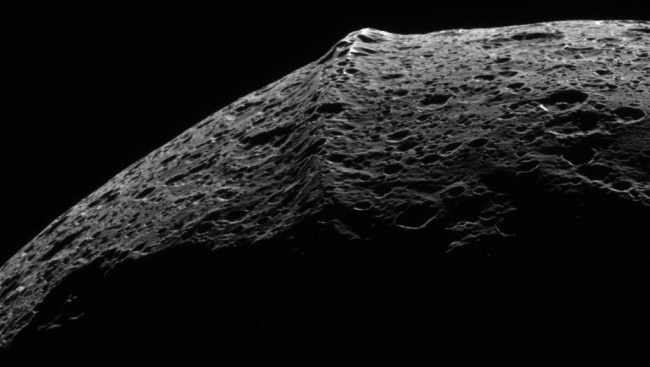 Combined with the moon's odd shape, the ridge gives Iapetus the overall appearance of a walnut. 1,300 km in length, 20 km wide, and 13 km high, this ridge is three times the length of the Grand Canyon, twice as wide as the Amazon river during the dry season, and one-and-a-half times the height of Mount Everest. The ridge's peaks are amongst the tallest mountains in the Solar System, just behind Mars' Olympus Mons volcano, which is 22 km high. Scientists don't know how the ridge formed or why it follows the equator almost perfectly. One theory suggests that the moon had a ring system early in its life that slowly fell to the surface under the force of gravity, building up a ridge of fallen debris. Other theories involve more complex interactions of material below the surface, but none can adequately explain why the ridge is confined to its location.